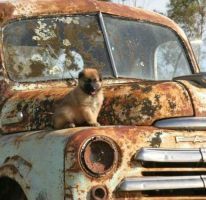 Belgian Shepherd breeders links and breed information on pups4sale.com.au. pups4sale testimonial: ...all (pups) have now sold thanks to your website, which made it so easy. Thank you! 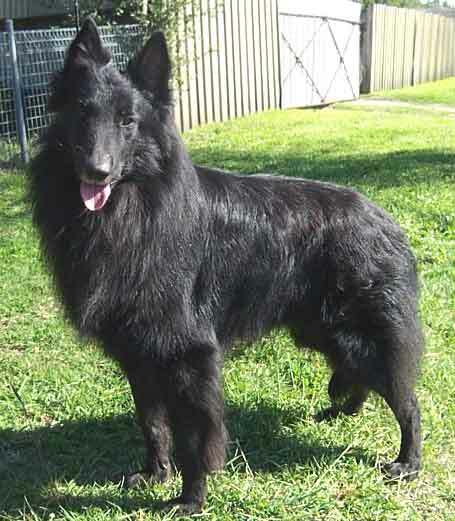 The Belgian Shepherd, also known as the Chien de Berger Belge or Belgian Sheepdog, is a single breed of dog that comes in four different varieties: the Belgian Groenendael, the Belgian Tervuren, the Belgian Malinois , and the Belgian Laekenois. There are some minor differences between the four, but they are basically the same dogs with different coats. Belgian Shepherds are active, intelligent dogs that have come to be known as fantastic companions for people of all ages. They aren't the easiest dogs to train, but those who take the time to get the most out of this breed will end up with a top-notch pooch. Thanks to Weedram Belgian Shepherds for the pictures of Belgian Shepherd Dog puppies & adults used on this page, and the additional information provided. All Belgian Shepherds have proportional, muscular frames and are usually considered to be some of the biggest medium-sized dogs. They have flat heads that point out at the snout, and their ears are triangular and erect. Male Belgian Shepherds grow to be between 23 and 26 inches tall, while females are usually an inch or two shorter. Both Belgian Shepherd sexes end up weighing between 65 and 75 pounds, but they can weigh a bit more or a bit less than that. All Belgian Shepherds have double coats, but the coats' characteristics are what separates the four varieties. Groenendaels have long coats that are usually completely black, though once in a while they will end up with a white patch or two. Tervurens have thick, mahogany coats with some black mixed in. Malinois have similar color features to the German Shepherd, with mahogany or tan being the base color, and solid black on their faces. The Laekenois, the rarest of the Belgian Shepherds, have wool-like hair that is a mix of brown and white. Belgian Shepherds are extremely smart and very protective, which can be a great mix when they are well trained, but it can also be a bad mix if they are matched with owners who don't know how to handle this type of breed. Socialization is extremely important with Belgian Shepherds because they need to learn early in their lives that they can't always go by their instincts when dealing with certain situations. If socialized correctly, they can end up being great all-around dogs. Belgian Shepherd puppies learn very quickly, so it's okay for owners to start teaching them simple commands at a very young age. In fact, this i8s the best time to teach these dogs how to act around both people and other animals. If owners have children, it's very important that Belgian Shepherds get to know them when they are young so they know how they can act around them once they get older. Belgian Shepherds are usually fantastic family pets, but they also like to be leaders rather than followers, so teaching them to be as respectful towards kids as they are towards adults can go a long way. Belgian Shepherds are natural herders, so they will sometimes attempt to herd dogs and other animals. They will naturally want to be the dominant dog when around other breeds, so owners need to get through to them early on that they need to be calm around other animals. Belgian Shepherds make great guard dogs because they do have that natural protective instinct. They are completely fearless when it comes to protecting their owners, which is why they have come to be known as some of the best police dogs in existence today. Because Belgian Shepherds are active dogs with active brains, they shouldn't be left alone for long periods. This can result in them chewing furniture or running into things around the house while trying to release some energy. However, if they do get regular exercise, it's okay to leave them home alone for a little while. Some people will look at Belgian Shepherds and think that they must be easy to teach since they do so well as police dogs. It's not good to think this way, though, because a lot of work goes into getting a Belgian Shepherd to be that well trained. They are intelligent, which is a great thing, but it also means that they are stubborn. As long as the person who is training a Belgian Shepherd knows how to be firm and positive during training sessions, then this breed can learn commands in no time at all. They simply have to learn that they are not the alpha in the relationship, which can take a bit of time for them to grasp. After that, though, training a Belgian Shepherd is a piece of cake. The fact that Belgian Shepherds have a natural instinct to protect the people and animals that they know, this is one thing that owners don't have to train them on. However, it is important that they learn to stop barking on command, so owners should work with them on this early and often to make sure that they respond quickly once they are adults. Even though not everyone is going to be utilizing their Belgian Shepherd as a herder or working dog, it is still vital that this breed gets a lot of exercise every single day. Intelligent, working breeds like the Belgian Shepherd need to be able to use their intelligence and their large amount of energy in some way. That can be regular running ad walking, but it should also include some type of games inside or outside of the house. Even though all dogs should be on their leashes most of the time when they are away from the house, the Belgian Shepherd is happiest when it has free room to roam. This is why they are perfect for dog parks and large fenced in areas after they have been trained to act appropriately around other animals and strangers. Belgian Shepherds will shed their coats twice a year, so it's important that owners brush their hair at least once per week to keep it from getting all over the house. It's true that some of the variations of the Belgian Shepherd have shorter coats than the others, but they all need to be brushed regularly. This breed also grows hair under their paws, so owners should make sure that it is short enough so the dogs are always walking and running on the pads of their feet. Otherwise, they can end up feeling uncomfortable when moving around and this also ups the chances of them ending up with joint issues. As far as other grooming needs go, Belgian Shepherds need their teeth brushed, ears checked and nails trimmed regularly. They don't have any special grooming needs like some other breed do because they are relatively clean dogs. Belgian Shepherds have long been known for being one of the healthiest breeds of this size. A typical Belgian Shepherd will live about 14 years or more, which is a lot longer than many other breed of this size. Some common health issues with this breed are allergies, epilepsy and hip dysplasia. These things can be avoided, though, if they are kept on a proper diet and are exercised the appropriate amount every day. One thing that owners should keep an eye out for is overfeeding their Belgian Shepherds. This breed does have a tendency to become overweight fairly quickly, so it is important that owners make sure that they don't give them more food than is recommended. Belgian Shepherds may look like the perfect dog to own for both single people and for families, but the perfect match is anyone who is willing to go the extra mile in training them and has the time to walk and run with this breed every day. Belgian Shepherds are definitely up for some hiking, so owners who regularly like to go on runs and hikes will be perfect for this breed. They don't need to go on hikes all of the time, but someone who has the time to take them on a long hike five or six times a year will have a very happy dog. Anyone who simply doesn't know how to take charge with this type of breed will have a very hard time bringing up a a good all-around Belgian Shepherd. This is why it is not a recommended breed for people who have never owned a dog before. People who want a dog that is happy to be in the house all day are definitely not a good match for the Belgian Shepherd. They need as much time to exercise their brains and their bodies as possible, so owners who don't have the time to give them that should look for another type of dog. The Belgian Shepherd may be a bit of a complicated breed because of its unique mix of needs, but there aren't too many other dog breeds out there that are as complete as this one. They can be the loveable playful dogs that people of all ages can play with, but they are also extremely protective, so they make fantastic guard dogs, as well.